The Sun Sawed in 1/2’s Rational Exuberance | Pop That Goes Crunch! Sometimes I’m in the mood for straightforward bass-guitar-drums and voice rock and roll. Other times, though, I reach for more elaborate, intricately arranged and lushly detailed pop. 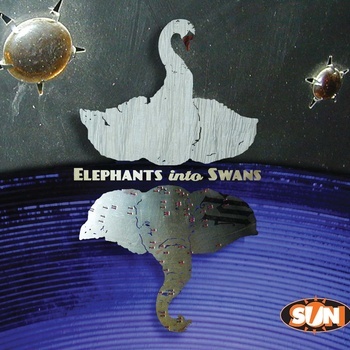 Elephants into Swans, the new record by The Sun Sawed in 1/2 — their first in thirteen years — fits squarely into the latter category. Its one of the best, most exuberant releases in quite some time. The Sun Sawed in 1/2 is (very) often compared to Jellyfish, and for good reason. Its sound is equal parts brash, quirky, serious, not serious, psychedelic, fun, and purposefully over-the-top. Elephants into Swans is all of that. It’s also smart, melodic and filled with hooks that increasingly grab your attention upon repeated listening. And, for good measure, it picks up steam as it proceeds, making it the rare record that does front-load its virtues. Indeed, “sounding great” is the partly the reason for Elephants into Swans to be. “She Offers Her Heart” adds horns to the chorus to up the exuberance factor: “She offers me her heart/and now I’m in love and now I’m in love/and now I’m in love and now I’m in love.” You can’t get any more enthusiastic than that. By the end of it, with the words “waltzing in clover” sung over themselves in a dizzying carousel of joy, you can’t help but think: “all you need is love,” in the words of one of The Sun Sawed In 1/2’s other major influences. Indeed, that could very well be the point made by the entire record. Elephants into Swans can be downloaded for $9 on Bandcamp, a cheap price for such gleeful happiness. Thanks, Tim! I could have embedded the entire record into this post. It is just that good. Looking forward to more great songs in the near future.